I feel strapped for cash all the time. Forward progress is happening, but it doesn’t feel forward enough. Fast enough. Can’t I just be early retired already? Progress is painful. It’s like I’m mile 2 into a marathon, just realizing that the longest I’ve run before is a 5k and that I already feel a cramp coming on. It’s like it’d be so easy to just say f-it, give up now, and I could still pat myself on the back for nearly besting my personal best. Holding myself to task with this public monthly reckoning is helping to hold me accountable. We paid off another credit card before interest came due. Out of the nine cards we have open, I’ll let you guess which one left is still interest free. You guessed the one with the large and growing balance? Congrats! You’re right. It’s got a 10k limit on it, so, pretty soon I won’t be able to place ordinary expenses on it and let it ride. I’m trying to funnel money into my cash savings account so I have liquid money available to do something big. Like buy a house. I’m aware a high limit on my card dings my credit. But it’s a small ding compared to the ding of not having cash reserves to buy a house. We’ve got almost 6k available now. That plus taking 3k from Roth (my contribution) + 20k from traditional IRAs (Derek and I both taking 10k) gives us 29k today that was have in hand to put towards a house. It can be a really bad idea to raid retirement accounts to buy a house. I’ll explain my thinking on why I don’t think it’s a bad idea in my case in another post sometime. Some of my stocks have taken a small dip. This is the problem with short term views. They may have been up three days ago, but today they’re slightly down. Next month maybe it’ll be up again. It’s the general broader trends that matter for these accounts, not the day to day fluctuations. Stupid grad loan debt. They’re not applying my extra payments properly to the principal. They’re advancing the “paid until” date on my loan. So, I’ve lost some motivation to pay more than the minimum payment. 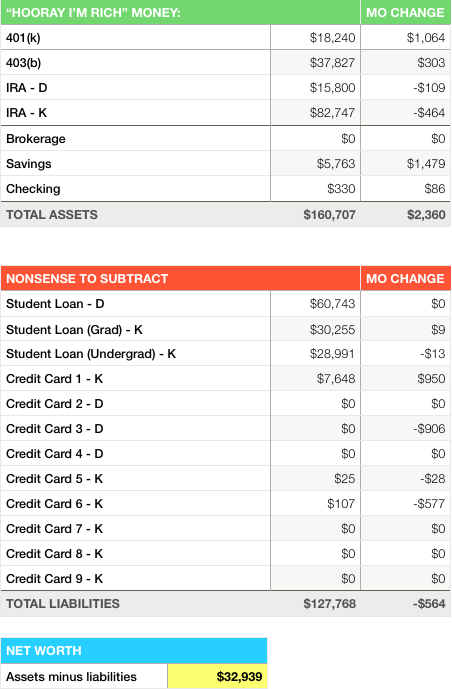 By only paying the minimum I owe through Income Based Repayment, my balance will GROW instead of SHRINK. That’s super terrible 1000 times round. That $9 haunts my dreams. I sometimes wonder if it is better to save to buy a house or if I try to find/save/earn 30k to get it gone for good as soon as possible.